Fairytales don't always happen once upon a time. Fables don't always have a happy ending. Sometimes the stories we love are too dark for nightmares. What if waking Sleeping Beauty was the worse thing the Prince could have done? What if Rapunzel wasn't in that tower for her own protection-but for everyone else's? 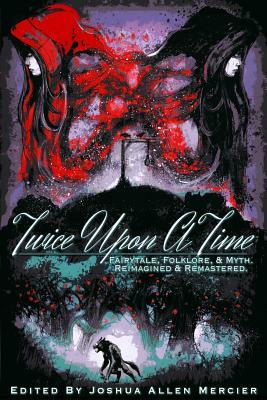 Assembled by The Bearded Scribe Press, Twice Upon A Time combines classics and modern lore in peculiar and spectacular ways. From Rapunzel to Rumpelstiltskin, this unique collection showcases childhood favorites unlike anything you've ever seen. Both traditionally-published and independent authors will take you on a whirlwind ride through fairytale and folklore, myth and majick. Cherished stories are revisited and remastered into newly-treasured tales of hope and heartache, of adversity and adventure. Featuring stories from Bo Balder, AJ Bauers, Carina Bissett, Rose Blackthorn, S.M. Blooding, Rick Chiantaretto, Richard Chizmar, Liz DeJesus, Court Ellyn, S.Q. Eries, Steven Anthony George, Dale W. Glaser, Jax Goss, K.R. Green, Kelly Hale, Tonia Marie Harris, Brian T. Hodges, Tarran Jones, Jason Kimble, Shari L. Klase, Alethea Kontis, Hannah Lesniak, Wayne Ligon, RS McCoy, Joshua Allen Mercier, Robert D. Moores, Diana Murdock, Nick Nafpliotis, Elizabeth J. Norton, Bobbie Palmer, William Petersen, Rebekah Phillips, Asa Powers, Joe Powers, Brian Rathbone, Julianne Snow, Tracy Arthur Soldan, C.L. Stegall, Brian W. Taylor, Kenechi Udogu, Onser von Fullon, Deborah Walker, Angela Wallace, and Cynthia Ward. Edited by Joshua Allen Mercier. Cover artwork by Luke Spooner. JOSHUA ALLEN MERCIER is the Founder and Executive Editor of The Bearded Scribe Press, an independent publishing house dedicated to the broad genre of speculative fiction. He is a writer, a self-confessed linguaphile and philologist, a proud bibliophile, a coffee addict, and an unrepentant grammar geek. He is also a professional mixologist (a darn good one, thank you very much!) with over fourteen years of cocktail-slinging experience. He currently has two series in progress, but that's all the information he's sharing about the projects at the moment. When he is not working, editing, or writing, he enjoys singing, cooking, and spending time with his family. Joshua lives in the Atlanta area with his partner, Jeremiah, and their two Chihuahuas, Bailey and Chanel.